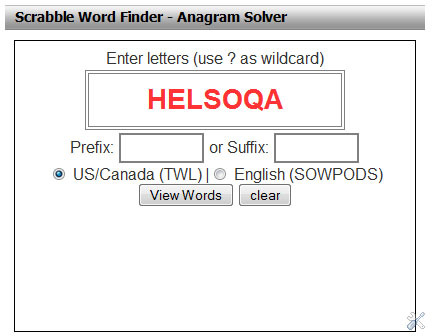 BoLS Crosswords has several Crossword solvers and anagram word finders. Here are the basics to these tools and how to get the most out of them. 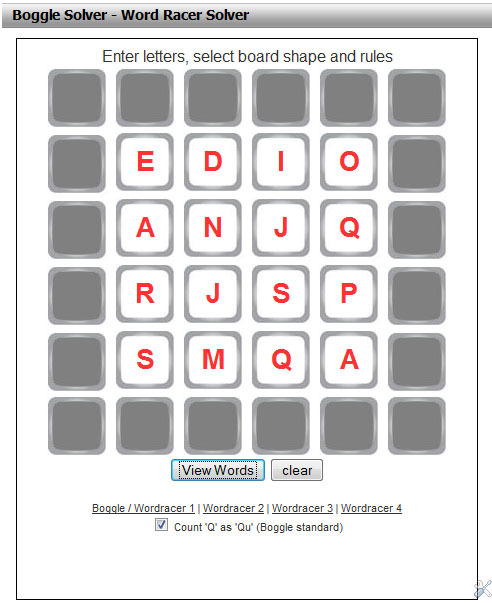 This tool allows a user to enter a grid of letters as found in several popular games such as Boggle and WordRacer, and outputs a list of all possible words based on the dictionary the user selects. 1) Select the board you wish to solve for (standard Boggle is the default, but alternative WordRacer boards are available). 3) Choose whether you wish "q" to count as "qu" (the Boggle default). The tool will display a list of all matching words, along with how much time the search took, and sort the results by length of word. You may have to scroll down to see later words based on what type of computer, or mobile device you are using. 5) Press the "clear" button to clear out the letter entry fields, while still displaying the results of the last search. This feature allows you to prepare for the next search quickly while still taking note of the previous results. Remember the #1 rule of BoLS Crosswords. 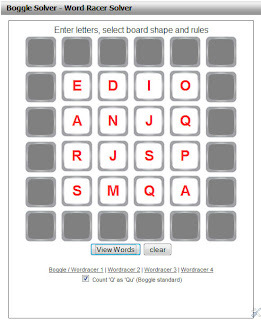 Our online crosswords word finders and tools are designed to improve your game, and make you a stronger player. They should be used to hone your skills play, or with the guidance of an experienced player who is helping you improve your game. They should never be used to give you and edge if you are solving crosswords in a competitive environment against other players. Have fun out there, and best wishes on growing into the strongest crossword puzzle player you can be!